Fundraising continued into the 1930s. This pamphlet is a photocopy of the programme for the `Miniature Hospital' exhibition in 1933. 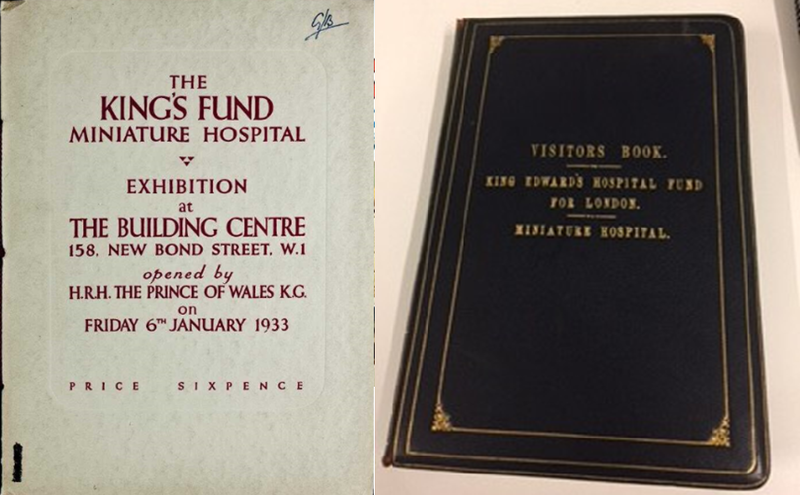 The King’s Fund Propaganda Committee commissioned a scale model of a modern hospital, including a children’s ward, an operating theatre and a working lift. The Committee hoped that the model would result in a more general understanding of a hospital’s function and importance. The model was displayed in London before touring the country; all proceeds went to help fund the voluntary hospitals. The first image shows the visitors’ book containing the signatures of many dignitaries who visited the model. The report contains pictures of the model. This must be the model hospital that provides the lovely image for the front of George Gosling’s new book ‘Payment and Philanthropy in British Healthcare, 1918-48’ (Manchester University Press, 2017). George’s book is important in relation to this issue of how we think about the pre-NHS system of hospital care.